Myron was born in Rocky Mount, North Carolina and at the age of 18 his family moved to SanDiego, California. He joined the United States Air Force in 1989 and Nellis Afb was his first duty station. After tours in Korea, England and his last duty station, Travis AFB in Norther California, Myron decided it was time to settle into a community. He tested for the LVMPD and entered the Corrections Academy in Feb of 2000. Myron was assigned to the North Tower Bureau and during his tenure he joined the SERT team and became a firearms instructor. In 2003 Myron was reassigned to South Central Area Command as the Prisoner Transport Operator. Myron also served as the Transport Driver for the newly formed Saturation team. In 2007 Myron was elected to the board of directors at the LVPPA. He spent a tour in Central Booking and from 2007-2010 and another tour in field services from 2011-2014. 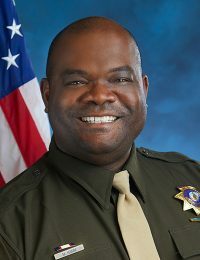 From 2015-2016 Myron was assigned to the Alternatives to incarceration section, in 2017 he was appointed to the LVPPA executive board as the Director of Corrections. Myron has been working with the board since his election in 2007, he has served on contract negotiation teams and spent many hours representing members in Internal Affairs.